Hidden behind goodness knows how many years’ of dust and plastic flowers, this beautiful time piece has quite probably gone unnoticed by the many visitors and users of the Women’s Institute Hall on West Street. Were it not for sharp-eyed Maggie Summerfield of the Rochford WI and her antipathy to fake flora, we would not have known of its existence. Set in the mantlepiece over the now blocked-up fireplace in the Hall, the corn sheaves wreathing the clockface speak to the building’s heritage (before passing into the WI’s ownership, it was a corn exchange). 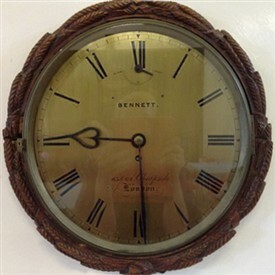 The clock itself has an impressive pedigree, having been made by Bennetts of 65 & 64 Cheapside. John Bennett (1814-1897), later "Sir John", came from a watch-making family in Greenwich, south-east London, a singularly appropriate birthplace for a horologist! He and his brother took over the family workshop when their father died. He is recorded as a watchmaker from the age of 16 and he started his own workshop in 1847 in Cheapside. John Bennett became renowned as one of the Victorian era’s flamboyant entrpreneurs, coming to the public’s attention during the Great Exhibition of 1851. The old Rochford Corn Exchange was but one of Bennett's customers; he counted the Royal Family and Charles Dickens among his clientele. He was appointed as a Royal Tradesman in 1858, knighted by Queen Victoria in St. Paul's Cathedral in 1871 and he was later elected Sheriff of London. He did not, however, succeed in all that he did; his bid to become Lord Mayor of London failed. Bennett's premises in Cheapside must have been something to behold in the mid-late 1800s; his shop windows were decorated with pocket watches and modern advertising slogans, and when the "Big Ben" clock was installed in the Palace of Westminster in 1860, Bennett built a similar clock with automata and presented it in his window. The display attracted so many people that the police had to control the traffic around his shop. The clock was later bought by Henry Ford and is still displayed in the Ford Museum in Dearborn, Michigan. The automata shown in the picture are Gog and Magog, the mythical ancient guardians of the City of London. This gallery was added by Helen Barnard on 15/06/2013. Excellent article and you found out a lot more about the clock than I did. It's great that a little bit more of our heritage will be noticed now. Thank you Helen.